ab205370 is expected to recognize isoform 1 (NP_004199.1), isoform 2 (NP_665811.1), isoform 3 (NP_665812.1) and isoform 4 (NP_001124318.1). Synthetic peptide corresponding to Human AIF aa 602-613 (C terminal) (Cysteine residue). WB: Jurkat and NIH3T3 cell lysates and mouse heart, pig heart, rat heart, mouse kidney and rat kidney tissue lysates. 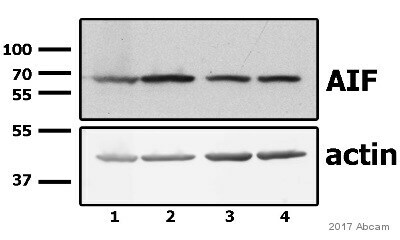 ab205370 is purified from goat serum by ammonium sulphate precipitation followed by antigen affinity chromatography using the immunizing peptide. Our Abpromise guarantee covers the use of ab205370 in the following tested applications. WB Use a concentration of 0.01 - 0.03 µg/ml. Detects a band of approximately 70 kDa (predicted molecular weight: 67 kDa). ab205370 has not yet been referenced specifically in any publications. Publishing research using ab205370? Please let us know so that we can cite the reference in this datasheet.